I've decided that this year will be the year of the miniature quilts at Magpie Quilts. I hope to make at least one for every week of the year - I'm behind already, but we will catch up! I am determined! Here's the first four for 2016! These all started with a few coordinating fabrics from my stash of fabrics, a block pattern and a border or two. All these mini quilts can be used on the table as seen in the photos or they can be hung on the wall with command hooks and a dowel. The last of the first four miniature quilts is made from a fan block that's been in my cupboard for a very long time. 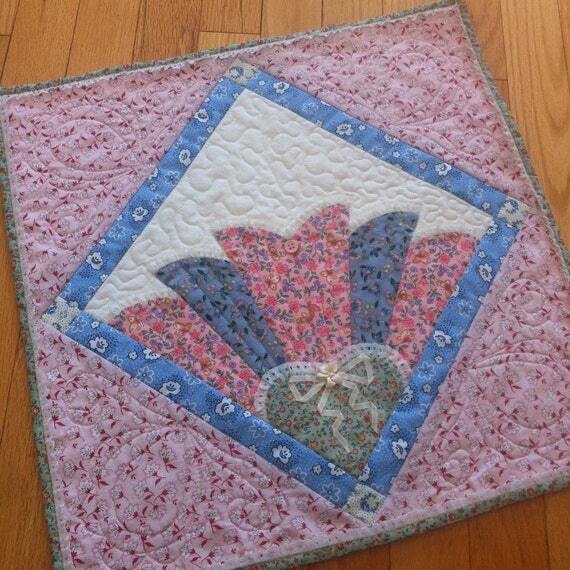 The block is from Quilter's Newsletter magazine and they had done a series of embellished fan blocks. I never made more than the single block and never had quite the right project to use it in. So I made a miniature quilt around the block and I love the final result. Do you have something that's been in your stash of fabrics or UFO's (Unfinished Objects) for a very long time? Perhaps you can turn it into a mini quilt!